My oldest child is a kitchen helper. She likes to make coffee in the morning, operate the blender for her morning smoothie, and load the dishwasher. At 5, she’s getting to be pretty capable, albeit with lots of time, supervision, and patience on my part. I don’t always have those things in the dinnertime rush after work and school – but weekends can be another story. At this time of year in Vermont, what better way to practice kitchen skills than with food preservation? 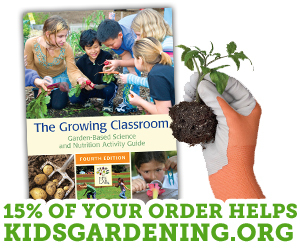 KidsGardening has lots of amazing resources for examining food preservation at home and at school. I thought I’d share how our family incorporates kids into preserving the harvest. While we do have a few strawberry plants in our garden, we use them mostly as garden bribery. So every June, we hit up a local strawberry patch and pick a huge flat of strawberries. This year, my 5-year-old helped to pick about half of the flat, and then trimmed the tops off carefully so we could make a simple homemade strawberry ice cream and freeze excess strawberries for smoothies throughout the summer. My green beans were kind of disappointing this year, but in past years, we’ve made a dozen jars of dilly beans, which don’t last very long at our house! I think my 5-year-old would eat a jar of dilly beans or pickled carrots daily if we let her. This year, we plan to buy beans from the farmer’s market, and my daughter can snap or cut off the ends, measure ingredients for pickling liquid, and put dill heads in prepared jars. And, of course, eat all the pickles. This year we planted two tomatillo plants. Which, honestly, was so unnecessary because we planted them last year as well and now have volunteer tomatillo plants like nobody’s business. They’re everywhere. But we love tomatillo salsa, so I let them stay. My daughter has learned when they’re ready to pick (when the fruit has filled up the husk), and the plants are hardy enough to withstand the way she yanks the fruit off. She likes to peel the husks off, which is great because it’s not my favorite task and many hands make light work. (My 2-year-old peeled one, freaked out when her hands got sticky, and moved on to more important things.) Traditionally, I take it from there, but maybe this year she can help me run the blender full of roasted tomatillos and garlic. (I’ve used many different salsa verde recipes, and it’s hard to go wrong, but I like the roasted ones best.) Sometimes I freeze it in batches and put it over a pork shoulder in the crockpot, or I’ll water bath can it to serve with tacos. Either way, my kids usually end up eating with a spoon. Do you preserve with your kids? What are some of their favorite recipes or techniques?